Buzkashi is Afghanistan's national sport, introduced by Djingiz Khan back in the 13th century. Every Friday, thousands of spectators goes to the fields north of Kabul to witness this grand spectacle in which hundreds of men on horseback fighting for a dead calf or a carcass of a lamb. It's crowded, sweaty and speedy. The players ride in clusters. They push both themselves and their horses to the utmost while they try to conquer the dead carcass. Points are awarded when the sheep are placed in a circle in the middle of the board. In a country that is one of the worlds poorest, buzkashi attracts large sums of money. 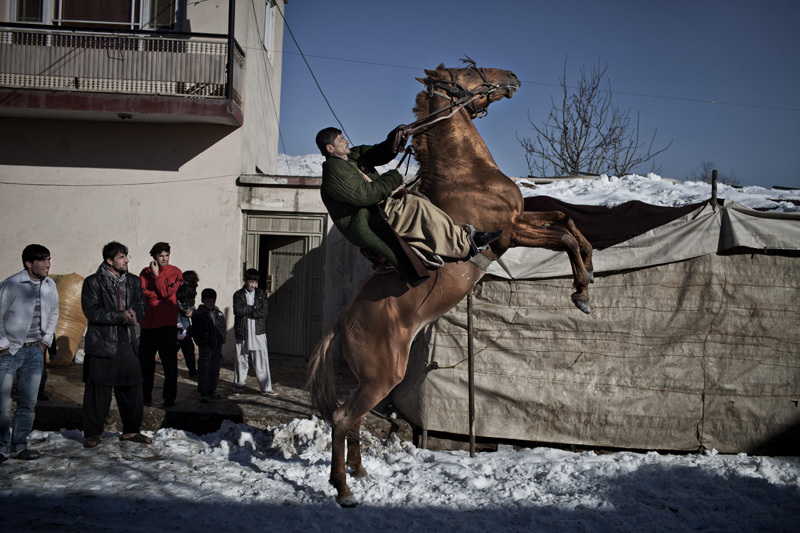 The best horses cost a fortune and a successful player can make a normal Afghan annual salary in a single game. But to become a good chapandaz requires years of hard training. Strength and courage are the two most important attributes. Abdulhaq Chrik trains his horse, Zarda. An important aspect of the training is to be able to pull up the horse on command in order to exit a bunch of horses and their riders during a match.